John Bosch bought Welling' s, an established restaurant on Main Street in 1939 and ran it for nearly 30 years. For the next few years various owners ran the restaurant under the Bosch name. In 1969, John's daughter, Catherine (Bosch) Wasson, took over the family operation. It is remembered as popular dining spot. It was first in the area to offer "smorgasbord" (Swedish for buffet) style service held every Thursday night for years. Bosch's was sold in the 1990s and evolved into several restaurant types since, including "At the Diner" and the "Elbo Room". "Rentenierend Koffie Drinkin Vereniging" hung in Bosch's for many years welcoming the "Retired Coffee Drinkers Society" where locals gathered daily to discuss both local and world affairs. Paul VanRaalte opened the Hub Restaurant on the south side of Main near Church Street in the 1950s. 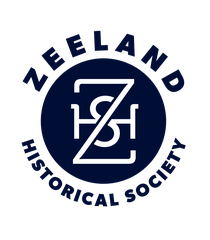 The 1953 menu on display was reprinted by the Zeeland Record. Was another popular eatery on the eastern edge of downtown. The 1959 menu on display was reprinted by the Zeeland Record. 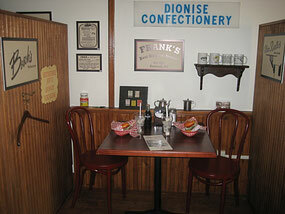 Franks began in 1924 as a fruit & confectionery store owned and operated by the Dionise family. Over time it evolved into a full scale family restaurant. It is Main Street's most popular breakfast and lunch spot boasting the "Best Burgers Around". After 88 years, it is still in the hands of 4th generation Dionise family. For years this upscale eatery was the destination for diners from miles around. It began where the Hub restaurant was located, but later a new, larger facility was built on the S.E. comer of Church & Main. It hosted area clubs and banquets as well as serving the public. On Friday and Saturday evenings it is remembered that folks came from miles around and stood in line to be served there. It was torn down in the 1980s and is now the site of the 1st Christian Reformed Church's Bridge Ministry.